No person should be allowed the luxury of holding a belief while ignoring its implications. Why? Because the implications of today’s prevalent beliefs shape the ethos of the next generation. For instance, suppose I had been born into a culture which had been largely shaped by the belief that the ability to overcome a rival tribe was conferred on me through a rite of manhood. Obviously, I would go through that rite. After several defeats I might come to question the effectiveness of the manhood ritual. 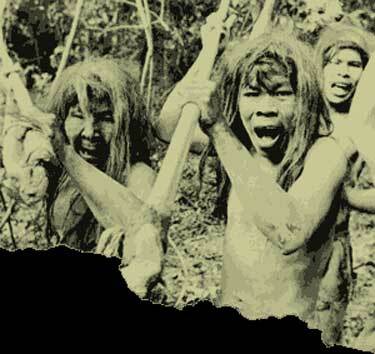 I might come to believe that the rival tribe’s practice of cannibalism made them more powerful. Since cannibalism had not been part of my cultural ethos, I would probably find the idea of eating another human to be distasteful (pardon the pun). For me, eating another person would be hard, but propagating my ideas would be easy. Suppose I convince others in the tribe of my position and after another defeat at which I get killed, they decide to eat a couple of the felled rival warriors. What if after that, my tribe won the next battle? My tribe would most likely continue to dabble in cannibalism. Within two generations the buffet would be open. P1- Meaning is an interpretive construct of a sentient mind. P2- Sentience requires interplay between evaluative consciousness and memory. P3- Consciousness and memory are products of chemical processes in the human brain. P4- When the brain is destroyed, consciousness ends and memories are erased. C1- Relative to the deceased individual, regardless of the details or duration, the life that he or she lived becomes retroactively meaningless. P5- At some point, all brains and their products will be destroyed. C2- Human life, regardless of the details or duration, is utterly meaningless. P6- Resources invested in something which is utterly meaningless are wasted. C3- The attempt to survive or accomplish anything is a total waste. If you are living in the West, then you were probably raised with a value system which says that you should value human life. The basis of that value is, “all men were created equal” or some similar formulation. Your heart is trying to retain a borrowed ethic the basis of which your mind and mouth deny. So, feel free to keep going where you’re going, just please admit that you are going there. Actions which are beneficial to life are preferable to actions non-beneficial to life. Actions that are neither beneficial or harmful, are either a matter of choice, random preference, or indifference. Intelligence is beneficial to life as it provides a predictability function to dealing with the issues of life. Intelligence seeing its possible demise can take actions to prevent the loss of itself. Enough intelligence and experience bring about self awareness. Self awareness brings the awareness of others. The acknowledgement of others, and of their own preferable existence brings morality. Intelligence, and the experience of life brings choices of enjoyable things..whether they be beneficial, neutral, or even detrimental. These enjoyable things bring purpose to the lives of the self-aware. Purpose even in the face of pain and death. Purpose gives meaning to the lives of men. The attaining of one’s purpose brings fulfillment and joy. Does it matter ultimately to the universe whether I enjoy life or take the life of another? Likely not. That doesn’t mean I stop enjoying life. Does it matter ultimately to the universe if man survives his self destructive tendencies or fails to overcome the test of time? Likely not. That doesn’t mean men can live, or have a meaning to live. Remember, it isn’t always the destination that is deemed important (if there is one). It’s the journey. As I die, I will know that I have lived a good, enjoyable, and purposeful life. Having lived a good life, I will die a good death. I think I could have figured most of that out. I’m familiar with the social contract theory of morality. You don’t really deal with the dilemma I proposed, however. Your explanation goes right up to the second before you die. I’m asking about the second after you die. Personally, I just have no tolerance for futility. Perhaps you do. If I were an atheist, I would have to eventually off myself. I just can’t live with that much denial. The thing is, it isn’t a life of denial, but of affirmations. I don’t spend my life going around giving the proverbial finger to any god. One couldn’t of course call oneself an atheist, or anti-theist and believe he was living in denial. The second after I die all the things I have done have not become futile because my votive force is gone. Hopefully, those things continue to bring a measure of positive influence to those that are alive. Like I said before, leaving my faith was one of the most difficult decisions of my life, and it wasn’t an act of denial, but of affirmation. I affirmed that what I wanted most was the truth, no matter how ugly it was. I affirmed that truth wasn’t to be found in the Bible based on its own internal evidence. Because I didn’t immediately have something to fill that spot does not mean that I chose to live in denial or futility, just as learning the truth about Santa or government isn’t about denial, but affirmation as well. Could I ‘off myself’? Perhaps I would if my environment has become negative enough. But it would be less ‘suicidal’ and more ‘self mercy killing’. I think you realize how valuable my life (and mind) are to me, so don’t worry about me jumping the shark. I am still awaiting your post on the non-existance of eternal torment. It should prove interesting. Yeah, I know it must have been hard to leave your faith. Ironically, your quest was probably inspired by the “faith” you had. CofC has its roots firmly planted in rationalism and the enlightenment. I can’t count how many times I heard “If it’s true it’s true even if you’re the only one who believes it.” The idea that truth can be grasped by the rational mind at all is purely a recent and fading development. Just more food for thought. I don’t want you to become a theist because disbelief in God is hard. I just want everyone who so vehemently pushes atheism to understand and own the moral ramifications. You said that a second after you die that the positive products of your life will go on. I believe that is right and its truly altruistic of you to find satisfaction in that. However, my syllogism didn’t stop with your death. What about when the sun goes supernova? Regardless of how far in future, that event will render everything done in our solar system moot. See what I mean? If that’s the case, Isn’t life just death-avoidance? I would understand why beings driven by primal survival instinct would not want to die but we who have developed the capacity to reflect on our own insignificance have no such excuse. So, I can’t see how a person who disbelieves in God can maintain any sense of purpose whatsoever except through diliberate short-sightedness. I certainly don’t want you or anyone to commit suicide but given that atheism is a faith-decision like theism, I would like for atheists to accept the ramifications of their position. It seems that its more fair to those who are weighing alternatives. Incidentally, I don’t think you are antitheist. I can’t and won’t blame you for disbelief in God. As I’ve already said, I admire your consistency heretofore. I do believe that if you remain consistent you will eventually reach some sort of faith in God sans all the dirty bathwater. But that is yet to be seen. It is likely true that the manner in which I left the faith had a lot to do with the manner of the faith. How is the idea that truth can be understood recent and fading? That sounds like a slippery slope to unthinking to me. I do realize that ultimately, man is likely to die out. That doesn’t mean that my life is meaningless either. The whole thing could just as easily be turned on its head. I could say that I don’t understand why man must externalizes meaning into a creator. Man’s mind, since it has separated by orders of magnitude from its cousins, tends to fear death, uncertainness, and the future. The act of deity creation gives one an out. Not just for explanations of unexplainable things, but also the ticket out of this world…life after life, immortality. Not having a sense of purpose results in the same “living in the now” as bespoke in the book..care not for the morrow.. If my consistency ever steps me back into theism, I still don’t see how that solves the problem, because in order to go beyond deism, and back into the belief of a personal deity, there would have to be the sort of proof asked for by Thomas, and we are told (by the book) would be given to those who ask, (though better not to). Look forward to the other…the swallowing of the tartarus idea is likely what originated the idea of hell in the first place. (another example of dirt in the bath water). I propose that if the ability to reason and conceive of eternity has arisen from random mutations then that mutation is a harmful one for the ultimate survival of the race because it will lead to self-annihilation in time assuming that faith is a vestigial coping mechanism. Nathan, I’ve enjoyed this as well. If reason and the conception of eternity have evolved in the human mind, with faith as a vestigial coping device, then it is possible that it will lead ultimately to self-destruction. It might very well do so, but I have a feeling that we have a good chance of ‘getting over the hump’ so to speak. So many people think that man has little distance yet to fully overcome his animalistic past. I believe otherwise. I think we are at the cusp of where things could go well, or poorly. We have barely shed our bestial nature, and it is uncertain if we will pull fully free of it. Considering recent history, I have fairly high hopes. Next, I’m anchored at the library, I’ll give that book a look up. Same goes for the video. Last time I had someone recommend something to me, I was abyssmally disappointed…from my best friend too. Things are crazy here, so pardon the delayed response. I’ll try to be quicker in the future. No worries on reply time. I’m busy as well. It’s kind of good to have the luxury of a slow conversation where no one interrupts! Yeah, look at those things when you get time. I don’t certify either for quality. They do, however, represent instances of the supernatural (or perhaps extra-dimensional) related as real and somewhat recent history which can either be verified or discredited through further research. Existentialism encountered the same fork in the road; purpose or nihilism.